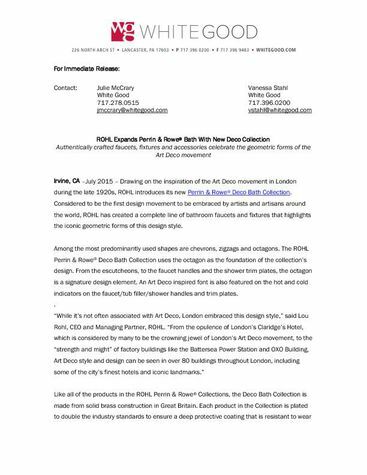 Drawing on the inspiration of the Art Deco movement in London during the late 1920s, ROHL introduces its new Perrin & Rowe® Deco Bath Collection. Considered to be the first design movement to be embraced by artists and artisans around the world, ROHL has created a complete line of bathroom faucets and fixtures that highlights the iconic geometric forms of this design style. Among the most predominantly used shapes are chevrons, zigzags and octagons. The ROHL Perrin & Rowe® Deco Bath Collection uses the octagon as the foundation of the collection’s design. From the escutcheons, to the faucet handles and the shower trim plates, the octagon is a signature design element. 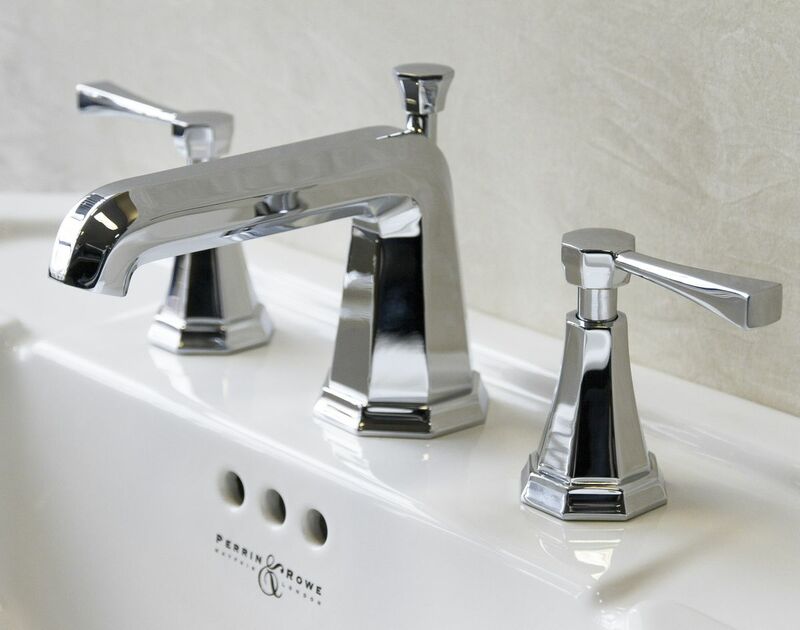 An Art Deco inspired font is also featured on the hot and cold indicators on the faucet/tub filler/shower handles and trim plates. Like all of the products in the ROHL Perrin & Rowe® Collections, the Deco Bath Collection is made from solid brass construction in Great Britain. Each product in the Collection is plated to double the industry standards to ensure a deep protective coating that is resistant to wear and tear, but is also pleasing to the eye. Each piece is assembled by hand, individually water tested and hand polished. The Deco Bath Collection is available in both cross and lever handles and comes in Polished Chrome, Polished Nickel and Satin Nickel finishes. The dichotomy of extravagance and functionality continues to make Art Deco as alluring to designers today as it was in its heyday. Ideal for the discerning consumer looking to bring an artistic flair to the home bath, the Collection offers a full suite, featuring faucets, tub fillers, shower kits, accessories and vitreous china. 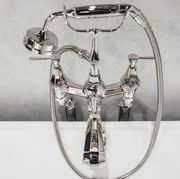 To learn more about the ROHL Perrin & Rowe® Deco Bath Collection, visit the ROHL Digital Pressroom, www.rohlpressroom.com or contact Julie McCrary, White Good, 717.278.0515, jmccrary@whitegood.com.